This has got to be one of the best $15 I have spent on a gift. My son wanted a small bouncy/skim ball for the beach, but unfortunately they didn't have the one he wanted. So I bought him a Wahu Beach Soccer Ball instead and he loves it. The ball is made from waterproof neoprene skin, is light to handle and has easy grip. 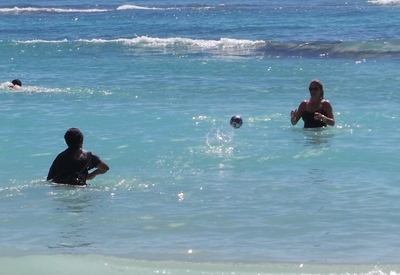 We have had hours of fun bouncing the ball on the water, both on the beach and in the swimming pool. The ball is about half the size of a regular soccer ball and is perfect for even young kids to handle. 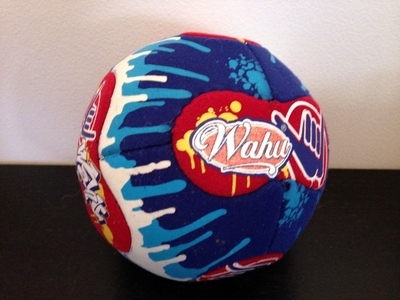 Wahu also make full size soccer balls, mini footy balls and regular size footy balls as well as a whole range of other fun water toys. I purchased the ball from Big W, however, they are also available from Uncle Pete's Toys for around $10.